Start On the north side of Highway 88 at Tragedy Spring, 9.0 miles east of Peddler Hill Maintenance Station and 2.9 miles west of the Silver Lake dam. End West end of Silver Lake dam on Highway 88. Park in the plowed area at the east end of the dam. 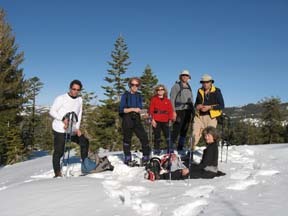 Like the spectacular Shealor Lakes and Silver Fork Ridge tour, this one-way tour follows the ridge that separates Shealor Lakes and the Silver Fork of the American River. However, unlike that tour you end this tour by descending to Silver Lake instead of retracing the ridge back to Tragedy Spring. This tour is also a variation of the Tragedy Spring to Silver Lake Via Ridge and Option 2 tour, which is a notch easier. The route along the ridge is filled with a succession of small high points that you traverse, rock outcroppings, weathered trees and magnificent views. On one side of the ridge you look down into the Shealor Lakes drainage and on the other out at the red cliffs of Thunder Mountain that contrast with the snow. 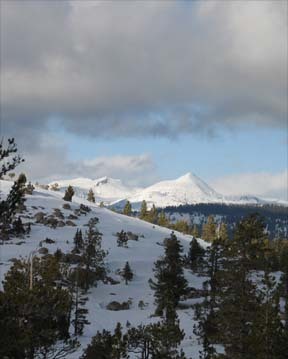 Pyramid Peak becomes larger and larger as you ski north. 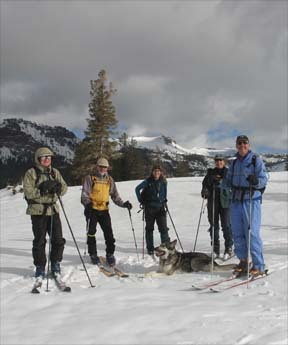 While this one-way tour eliminates the gradual climb back to Tragedy Spring, the descent to Silver Lake requires navigation with map and compass. The navigation is through dense timber with almost no views to get visual bearings and it makes this tour a notch more difficult than the round trip tour along the ridge. Although the tour described here does not go to Peak 7620 and the end of the ridge, you can easily add the additional 1.6 miles round trip and complete the tour in a day. Details are provided in the Shealor Lakes and Silver Fork Ridge tour. Finally, the Tragedy Spring to Silver Lake Via Ridge and Option 2 tour is an alternative for those seeking a loop tour but easier navigation. From the trailhead (1) ski east and then north on a snow-covered road for 0.4 mile until you reach a large, flat and open area (2) that is a quarry in summer. Locate and follow the ridge north for 0.9 miles until you reach Peak 7752 (3). Ski north on the ridge for 0.9 mile until your reach a point to the east of Peak 7681 (4) from which you can clearly see the route north below you. In this section you ski on the ridge until you reach a saddle and then you traverse and climb around the east (right) side of Peak 7681. Descend north on the ridge for 0.2 mile until you reach a broad saddle (5). Here you need to visually locate the route ahead. Look east and find a small ridge about 0.5 mile away with woods to its south (right). The route passes through the woods. 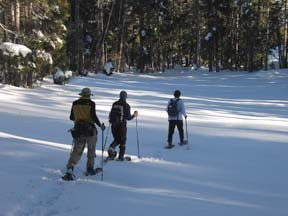 Ski west and into the woods and follow the path of least resistance for 0.3 mile until you reach the third small clearing (6). The clearings are actually small frozen lakes. Continue on the path of least resistance looping south, then north and then west for a total of 0.8 mile until you reach Highway 88 at the west end of the Silver Lake dam (7). If you descend too soon you will find yourself in very, very dense woods and will end up on Highway 88 west of the end point. In this case ski east (left) along the highway to reach the end point.